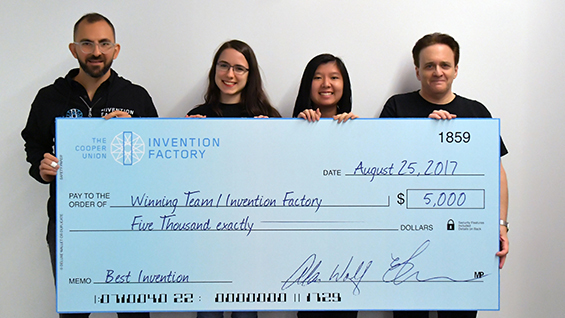 Invention Factory, the Cooper summer program that challenges students to invent a tangible product in only six weeks, wrapped up its fifth year with Sara Huang BSE’19 and Keti Vaso ChE’19 taking home the $5000 first prize for their suction-supported insulin pen with retractable bellow-encased needle, more simply referred to as Hid-In. The program, created and led by Professors Eric Lima and Alan Wolf, teaches students to conceive of and prototype inventions that they present each week to guest evaluators, culminating in a final competition where a panel of distinguished designers, inventors, engineers, and patent attorneys choose the best inventions. Previous winners included an anti-tremor spoon, a one-handed medical stitching device, a dual-flush toilet converter kit, and a rapid packing container. 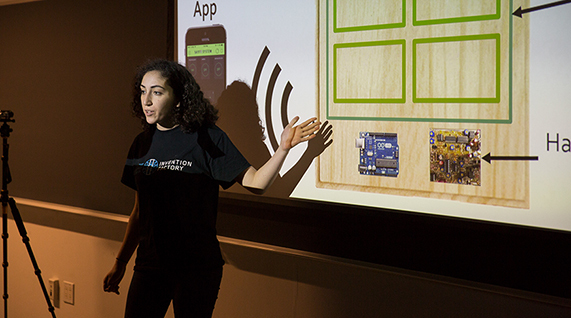 This year, ten pairs of rising sophomores and juniors drawn from the four engineering disciplines participated. 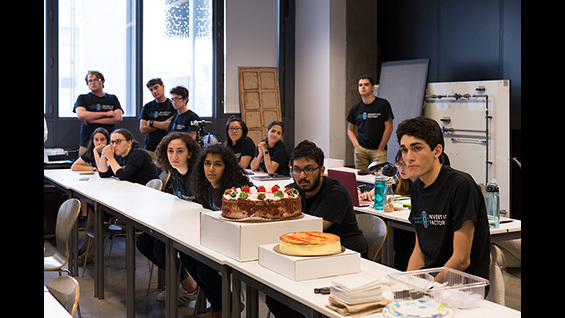 Each team received a budget of $2,000 for materials and each student received a $1,000 stipend at the end of the program. 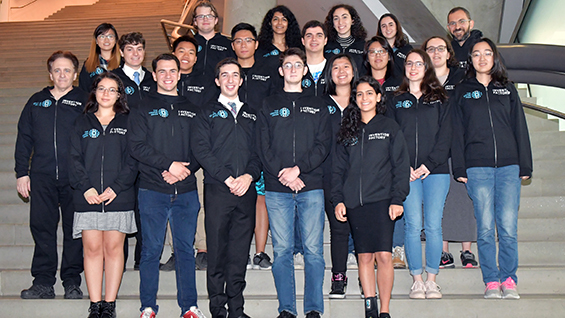 Prior to their final presentations, each team drafted and filed a provisional patent for their invention with the US Patent and Trademark Office. A provisional application provides a measure of protection on their invention for one year, giving them time to decide if they wish to file for a full patent. The competition concluded on Friday, August 25. Evaluators included members of the Cooper Union faculty, Associate Dean Anita Raja, Professor William Germano, and Professor Margaret Morton; alumni Jimmy Kwong ChE’80, Benedict Itri EE’75, Mark Epstein A’76, Barry Negrin ME’89, Ebele Kemery EE’07; and returning judge and patent attorney Ron Slusky. Invention Factory is generously funded by the Edward Durbin and Joan Morris Innovation Fund for the Albert Nerken School of Engineering. 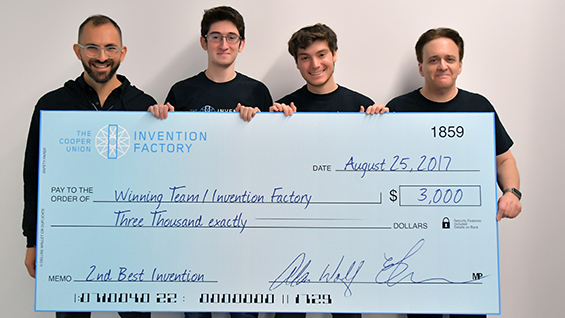 Invention Factory has been so successful with its structure that the program has expanded to Syracuse University. This summer it ran at Syracuse’s home campus and NYC facility. At all locations, emphasis is placed on research, design, and prototyping, but also presentation of the inventions. Professors Lima and Wolf enlisted the help of acting coach Dierdre Friel to provide tips for students on their delivery. 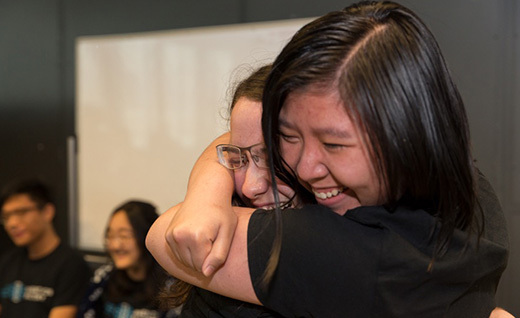 This year’s first place winners designed a solution to several problems faced by the 6 million Americans who inject insulin daily to treat their diabetes. Many diabetics miss insulin injections because current insulin pens are complicated to use, time consuming, and contribute to a fear of needles. The $3000 second place was awarded to Alon Levin and Benjamin Kaplan. 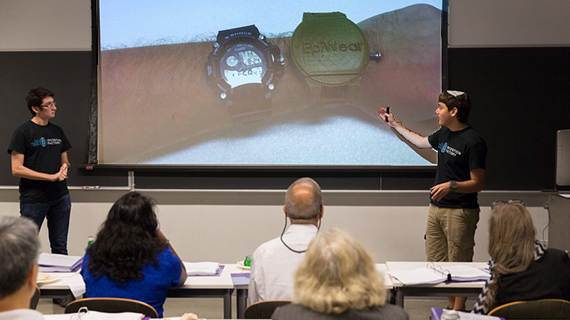 The rising sophomore electrical engineers invented the EpiWear, a wearable epinephrine injector. A measured dose of epinephrine is used by allergy sufferers as an emergency treatment for anaphylaxis. An epinephrine auto-injector is not a new idea; the modern EpiPen was first approved and introduced in the 1980s. According to Alon and Benjamin, “current models are bulky and complicated to operate.” However, the more important problem is that most people don’t carry their EpiPen with them at all times. An alarming statistic confirms this. For individuals prescribed EpiPens who died from anaphylaxis, fifty percent of the deaths occurred because the allergic individual didn’t have their EpiPen with them. The EpiWear is always at hand (or more accurately, “on wrist”). Alon and Benjamin’s injector is the size of a watch and can fit any standard watch band. The device’s top face can either be replaced with a watch face for discretion, or retained with its distinctive and informative indicia. 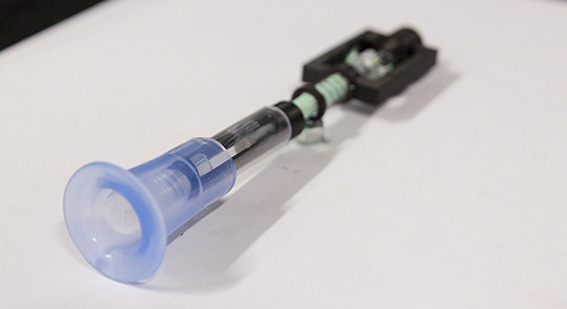 In use, the EpiWear is removed from the individual’s wrist and easily used to inject into the thigh muscle. A safety latch keeps the needle in place and prevents accidental deployment.